"I know a girl with kaleidoscope eyes." "Shortcake? Why are you asking about a shortcake?" 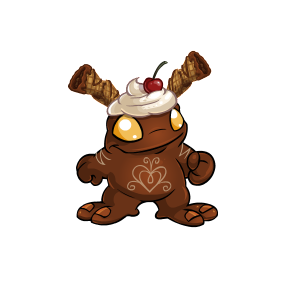 And a larger version of Chocolate, because who doesn't like more chocolate? I like the waffle cone antennae and the detail on the cherry. Otherwise, pretty standard. Strawberry is pretty standard, but I do like the leafy stem hair. The chocolate Grundo is nice but the waffle cone ears look out of place to me :/. They don't match the style of the rest of the pet. Still some lovely details and I like the cherry on top. The Strawberry one is pretty standard but the added touch of the leafy 'hair' is nice. Yeah, it's like the cone and cherry are all detailed and the rest is just flat colorfill and a couple swirls. It's a shame that so much effort was put into the excellent antennae that it makes the rest of the pet look distinctly bland. The white chocolate decoration looks flat and stuck on, especially on the torso where you'd expect to see some distortion (the Grundo's pose is rather confusing - it's standing slightly to the right but with its right arm forward and left arm back, so its body is mostly square-on to the viewer but surely the skin would be a bit stretched or twisted from top right to bottom left as we look at it, and across its belly). Strawberry is pretty standard, but even on that relatively straightforward colour the artist has spaced out the seeds differently on the abdomen to give the impression of a bit of tubbiness. So why not on Chocolate? Then again, maybe they tried it and it looked crap and this was the best alternative, who knows? I've never liked the patterns on chocolate. They always look a bit flat and crap compared to the rest of the pet. This is probably one of the worst. The waffle ears are so detailed that everything else looks much worse in comparison. Strawberry is okay, not as cute as some strawberries but not completely terrible. Chocolate: Not much to say here that everyone else hasn't said already, other than the whipped cream is shaded/colored rather nicely. I also feel like the nails should have been made out of a different material as well - white chocolate, maybe? 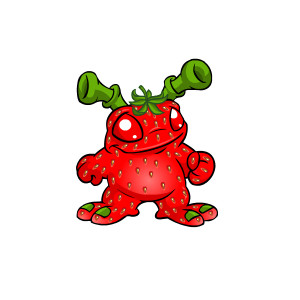 Strawberry: That top stem looks very tacked on and the seeds are a bit too uniformly placed. The highlighting looks nice though, so there's that.